South Carolina has seen its share of notorious murders and subsequent trials, but none rocked the political and publishing worlds quite like the 1903 murder of Columbia newspaper editor N.G. Gonzales by the Palmetto State’s lieutenant governor, James Tillman. Gonzales and his brother Ambrose founded The State newspaper in 1891 to support a number of progressive causes and to oppose the regime of outspoken militant segregationist Benjamin “Pitchfork” Tillman, governor of South Carolina from 1890 to 1894. Tillman’s nephew James was elected lieutenant governor in 1900, and his similar platform and political mudslinging made him a target for Gonzales as well. James Tillman’s problems with drinking and gambling were no secret, and they were frequent topics of Gonzales’ editorials. Underwood described one piece by Gonzales in The State that offered a sarcastic response to criticism of Tillman for betting on cockfights instead of attending to the duties of his office. “The piece basically said, ‘Oh, he wasn’t gambling. In gambling, you have to have something of value. All Tillman was wagering was his reputation, and nobody would claim that was anything of value,’” Underwood said. When Tillman unsuccessfully ran for governor in 1902, he blamed Gonzales’ unflattering coverage in The State for his loss. By the afternoon of Jan. 15, 1903, Tillman had had enough. He walked out of the Senate chambers for lunch, spotted Gonzales at the corner of Main and Gervais streets, and approached and shot him in the stomach. Gonzales died four days later. Tillman was arrested and reporters from around the country descended on the area to cover the proceedings. Tillman argued that he was forced to defend his honor after the negative press he had received from Gonzales. After a three-week trial, the jury returned a verdict of not guilty. 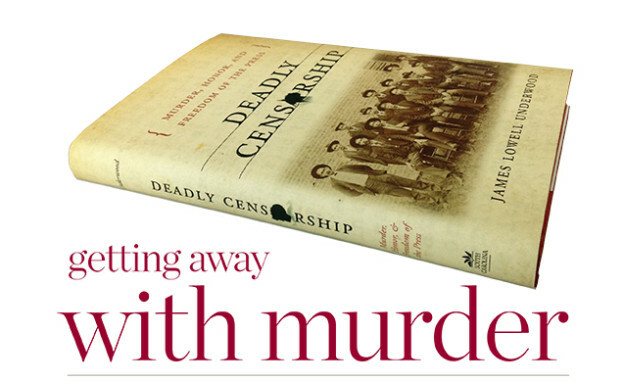 “Deadly Censorship: Murder, Honor, and Freedom of the Press” delves deep into the long-running animosity between Gonzales and Tillman that led to the shooting, the political and legal wrangling surrounding the trial, and the societal mores that led the jury to find it acceptable for one man to murder another in defense of honor. Underwood says he enjoyed researching and writing the book because he found it to be an exciting drama, with some intriguing trial strategy that those with an interest in the law will enjoy. But because the book doesn’t get lost in technicalities, it makes an interesting read for non-lawyers, as well. It has received many favorable reviews, including in American Journalism and Columbia Journalism Review. Underwood’s book was published in December 2013 by the University of South Carolina Press and is the culmination of nearly eight years of work that included archival research at the South Caroliniana Library, The State newspaper and the Library of Congress, as well as personal manuscript collections at Duke, Clemson and UNC Chapel Hill. It is available in ebook and hardcover formats from USC Press, Amazon.com and Barnes and Noble. This entry was posted in Spring 2015 on 18 March 2015 by Rob Schaller.